What are you reading and why are you reading it? I'm currently reading Sala's Gift by Ann Kirshner because I absolutely love historical fiction and I'm attempting to read any fiction I can that has a WWII/Holocaust backdrop. I am also reading Almost Home by Pam Jenoff because I love the author and wanted to give it a try. 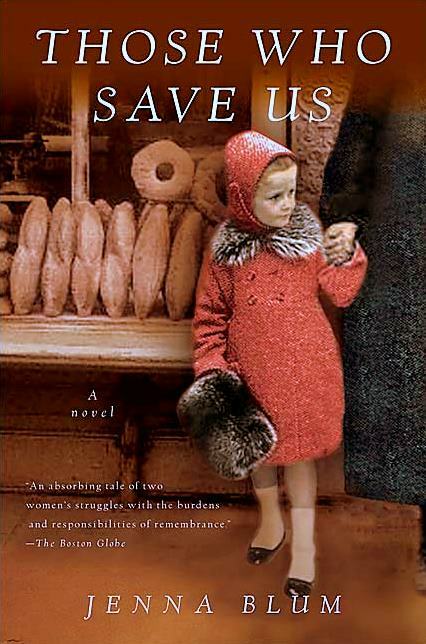 I am currently pushing Those Who Save Us by Jenna Blum. It is my newest book review and one of my favorite books. Thanks for stopping by my blog! What program did you use to make your banner? I use a program called GIMP but it really limits me on what I can do. I'm looking for a better one. I had know idea you could use publisher lol I'll have to try that out sometime! GIMP is something I downloaded off the internet for free. It's sort of like paint shop pro but it only lets you do the basics. Found your blog through Follow Friday. Your About Me page says you worked through Teach for America. I am considering applying. I have several questions. If you don't mind answering them, please email me directly. thethingsweread@gmail.com Thanks! I haven't heard of SALA'S GIFT but I love the cover. I'll have to seek it out. I've heard such good things about Those Who Save Us. I met the author and she was so nice and ever since then I wanted to read the book, but I haven't got around to it. I love WWII historical fiction. Those Who Save Us sounds really good. 'Sala's Gift' does sound interesting - I think I'll add it to my tbr pile. I recently got 'A Child al Confino: The True Story of a Jewish Boy and His Mother in Mussolini's Italy' (Amazon gave it away for free for Kindles), so that's two WWII books to look forward to. Thanks for hopping by! Don't you love it when you find a new favorite book? Your reads sounds fascinating. Found you on Networked Blogs - new follower. I like your selection of books so far. The only historical fiction I've ever read is Johnny Tremain. Does that count?